To see the previous stylings in this series of styling posts, click here! It is with a dose of sadness that I present to you the last of our items that changed the world styling post. Yes, it’s true. Okay, maybe I’m being a tad dramatic, so let’s bring up the mood! You voted on the items to be used in the previous post and this post…so what was your pick besides the Chanel Suit?! Dorothy’s Ruby Slippers! I think most everyone knows the background on these shoes…but I was surprised about a few facts that I learned in my book. Maybe I was just silly to not know them, or maybe they are in fact little known facts….you tell me! L Frank Baum, author of The Wonderful Wizard of Oz, described Dorothy’s shoes as silver. So where did the red come from?! It was MGM’s interpretation! The choice of red for the shoes was extremely practical…red showed up best on screen. Adrian Adolph Greenberg, the MGM costume designer, created the shoes by covering white silk shoes with organza and bows encrusted with beads and rhinestones. Today, four pairs of “the” ruby slippers exist! Four! What is it about these shoes that make them so iconic? Well, obviously, they are synonymous with the movie…you think of Dorothy, and you think of her ruby slippers. But additionally, it is perhaps that the magic of the shoes is found in the facts that they are bold, get one noticed, and are also quite empowering. I actually saw them (okay, one of the four (!) pairs) in a Smithsonian museum once and was able to snap a few photos…who knew at that point in time I’d be using them on my blog (this was before I started the blog)?! I’ll admit they aren’t the best photos, but to defend myself, they were in a dimly lit area and hey, it’s museum lighting! This is probably one of the more abstract interpretations. The nearly menswear inspired jacket represents the empowerment of the shoes (and the boldness), while the glimmering necklace and shoes add that sparkle. The delicate striped top that would just barely peek out from underneath the jacket also adds to the feminine side of the look. This is a much more glamorous take. There is no doubt in my mind that one who showed up to an event in this ensemble would get tons of compliments and double takes, all the while feeling extremely confident. The sparkle is definitely evident in the jacket and rings, while the pop of color in the clutch is a nice touch. The black dress is timeless, and helps to ground the look. Want just one item from Anthro to remind you of Dorothy’s ruby slippers? Try these! And so now that we’re officially done with this series, tell me…which was your favorite look from any of the posts throughout this series? Did you like these featured posts? Spill the beans! As you all know, the results were tallied as to which two items I would be creating Anthro stylings after! I already let you in on the fact that the winners were not either Heelless Boots or Cher’s “Moonstruck” Oscars Dress. So which winner am I styling today? It’s the Chanel Suit! I’m sure I don’t need to explain to anyone who Chanel was/is, but I will go into a little detail on this suit. I should first make clear that this is not just one specific suit, but rather a style that Chanel created and a design that was repeated again and again and again (to this day). In one word, it can be described as classic. Part of what made it such a revolutionary design was the fact that oftentimes, the fabric was tweed. Previously, this was seen as a cheap, menswear fabric. However, the suits were anything but cheap. The fur or silk that she used to line the suits added a huge dose of luxury. The complete look was high-class, but not too stuffy; tailored, but not too tailored; and simply elegant. Oftentimes, there was contrasting trim, as seen in the first picture, but not always, as shown in this picture. Perhaps equally as important as the design was the fact that these suits helped to empower women. Did I confuse you?! 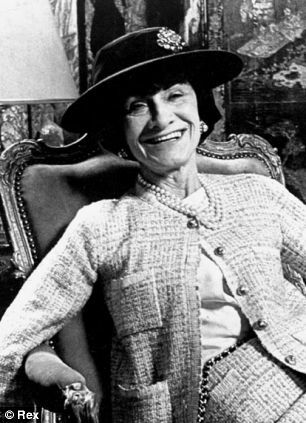 Yes, the Chanel Suit traditionally included a skirt, but hey, this is an interpretation. However, these pieces do stay true to our inspiration. The rich color scheme adds to the elegant feel, while all the subtle textures make up for the lack of a bright color. Keep the jacket open to allow the texture of the shirt and skirt to really play off of each other in this once again, sophisticated look. 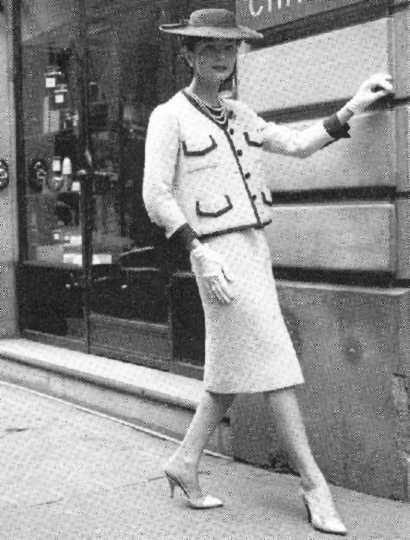 The jacket really is the essence of the Chanel suit in this styling. Unlike the last two looks in which the inspiration was greatly seen in the top, this time the inspiration is most prominently seen in the skirt. I’m not going to lie; this is a pretty committed, vintage look. But for those not afraid, I’m sure you could conquer it and rock it! That wraps up this post…any guesses as to which other inspiration that you voted for has been picked?! Stay tuned to find out, but let me know your predictions! Also, as a gentle reminder, please don’t hesitate to send me any and all of your styling requests (the page has been updated…click the link!)! There is no need to be shy! Thanks so much to everyone who voted here! The results are in, and I’ll be working on the stylings! Any predictions as to the winners?! I won’t give away the winners, but I will eliminate two possibilities: Heelless Boots and Cher’s “Moonstruck” Oscars Dress. Do your original predictions still stand a chance?! Hope everyone is having a great week – two more days until the weekend! Two pairs of shoes and three dresses after I originally announced the series of styling posts inspired by a dress or pair of shoes that changed the world, it’s time for you to get involved! Yep, you read right – you! I encourage you to go back and take a look at the five posts if you missed any of them by clicking here! Go on, I’ll wait for you (if you’re already caught up, yay!)! Now, here’s how it works: You may vote for two (2) items. The results do not show, as it will be a surprise for everyone! Whichever two (2) items receive the most votes by 4:00 pm EST on Wednesday will be the two items I will do stylings on! Thanks for participating! To see the first four posts in this styling series, go here! Art students are notoriously known for their sometimes wacky and out there ideas (well, maybe I should scratch “art students” and say “anyone in an industry related to the arts”). 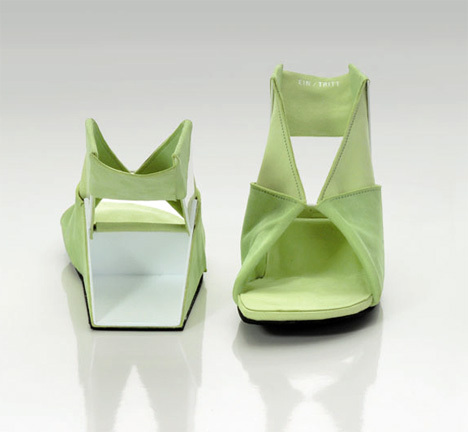 So what if I were to tell you that one student designed a mini collection of shoes based on medical bandages? You might think, “Crazy! Whack-a-doodle ____!” You can fill in the blank with whatever you want, but after actually seeing the shoes, you might change that word to something like “genius” or “incredible” or “I-need-those-shoes!” This story isn’t hypothetical. Take a look. A bit unconventional? Perhaps. A bit daring? Yes. A bit creative? A big yes! A bit sophisticated? Yep! Whether you covet or loathe these, you have to admit you’re intrigued by them! 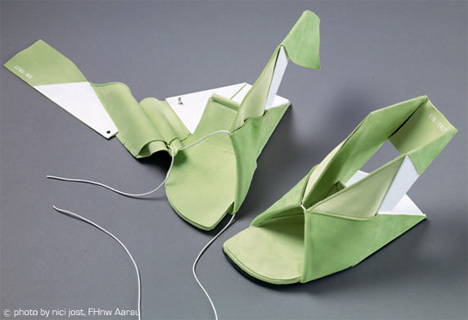 Gwendolyn Huskens designed them for her graduation show at Eindhoven’s Academy of Art in the Netherlands. She appropriately named the collection “Medic Esthetic.” Kind of a cute name, huh?! Obviously my Anthro stylings are pretty abstract, considering Anthro sure isn’t selling bandage inspired clothing! But that’s okay! It is, after all, inspiration! Texture, though, was my foremost concern. Texture, texture, texture! I think I certainly accomplished that goal in this look! I absolutely love the seaming in the pants. This skirt, with its leather and wool sections, just screamed out to me to be used in a styling for this inspiration! Tuck in the shirt and add the more feminine touched necklace and gorgeous shoes, and it’s a complete look! You could easily add some gorgeous tights for added warmth and texture! What do you think of these stylings? Perhaps more interestingly, what do you think of Huskens’s shoes?! By the way, did anyone tune into Project Runway’s finale last night?! (If you haven’t but plan on doing so, stop reading…spoilers!!!). Who do you think should have won? I’m disappointed…I was for Mondo!!! I’ll be doing a post tomorrow having to do with the finale! To see the first three looks in this series of posts, hop on over here! In 1993, menswear designer Paul Smith created a womenswear collection. In 2004, he debuted the “tea dress.” And this, is our focus today. So what is this so-called “tea dress?” Well, in one word, it’s versatile. Besides that, it’s a pretty relaxed, flowy silhouette. It’s a dress one can wear for numerous occasions, possibly by just a few minor accessory changes. Best of all though, it’s a timeless piece that gets updated year after year, but never really goes completely out of style. It’s usually characterized by a print, although there truly are so many variations. Without question though, it’s feminine! Tuck in the top to this incredible gorgeously detailed skirt, and you’ve got a perfect base to a “tea dress” inspired look. Finish off with some heels that tie in the black and blue color scheme and a fabulous bag (you could add tights if need be). This is the perfect work look. But what about a night out?! Here’s another effortless work look! The fuchsia in the dress really pops with the green shoes! But what about a weekend look?! Now tell me, have you ever worn anything similar to the tea dress silhouette? If not, would you consider it now having seen these two stylings? And which styling do you prefer? This is part of a series of styling posts in which I am taking a dress or pair of shoes that supposedly changed the world and translating the look into an Anthro head-to-toe styling. If you missed any of the other posts in this series, feel free to go here to check them out! Ah, the hippie era! It largely consisted of loose-fitting clothing, often in kaleidoscopic patterns. The dress we’re looking at today is certainly over the top. There’s nothing minimalistic about it. Quirky? Yes. Minimal? No! Take a look. So what exactly are the details on this dress? It was designed by Bill Gibb in 1971. Twiggy wore it to the premiere of The Boy Friend. This look is all about textures (and the allusion of them). The blouse’s print paired with the layered skirt and printed tights really achieves this. Adding on a necklace further emphasizes the point, while the shoes balance out the look. Now tell me…would you ever consider wearing something quite as bold as the original dress in your everyday life? Or, would you rather stick with the toned down (but still utterly fabulous!) versions, as shown in the stylings? A few days ago I introduced you to a series of styling posts based on dresses or shoes from one of two books I received for my birthday a little while back (the books are on dresses and shoes that changed the world). Today, we’re looking at a shoe. I’ll be honest with you…this shoe was news to me when I saw it. I sure had never seen it before, but, man, did it intrigue me!!! It’s literally an origami style shoe. Talk about innovation! 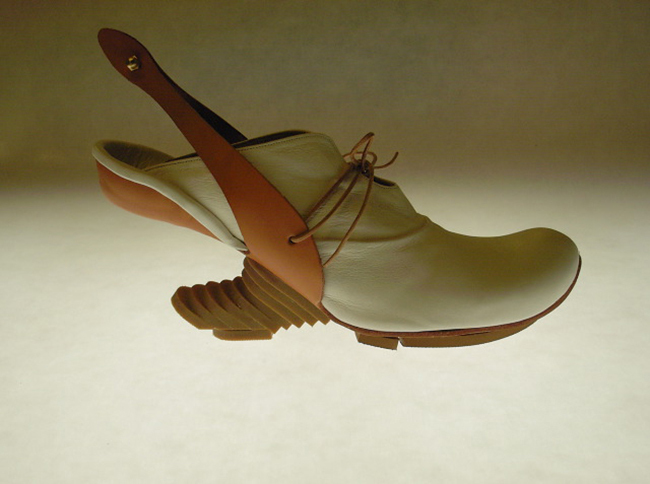 The shoes were designed by Catherine Meuter. Intrigued by this particular design, I decided to “google” her. I found her website and was fascinated by some of her other designs. Take a look! Although these shoes are also quite interesting, my inspired Anthro styling will be based on the first shoe I showed you. Creating the head-to-toe look was more challenging than usual, because this shoe is so unique. In the end, I think I captured the essence of the shoes, but you’ll have to let me know. The coat is what really started this outfit…something about it just seemed to correlate with the shoes. The outfit underneath also has a similar vibe, but it truly is all about the coat. Tell me…what do you think of these shoes? Had you heard about them before? And what do you think about Catherine Meuter’s other designs?! For my birthday, I mentioned receiving two books: one about dresses that changed the world, and another about shoes that changed the world. I’ve decided to do a series of posts looking at a few of these dresses/shoes, and then creating head-to-toe Anthro looks based off the pieces! This will combine my love of vintage fashion, fashion, and Anthro! Today’s dress is not really one dress, but a whole era of dresses. That is, what is deemed as Christian Dior’s “New Look.” Perhaps you’ve heard of this, perhaps not. If you’ve ever studied World War II fashion, you definitely have though. During the war, because of numerous factors, including the fact that resources were limited, the motto was pretty much to make do and mend. 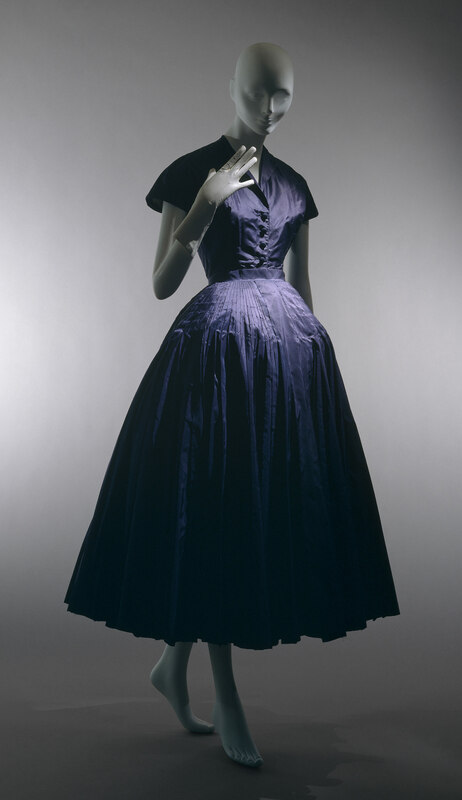 As the war ended, Christian Dior introduced a new silhouette…one that brought luxury back to fashion. More so than that, it brought the focus back onto fashion and its innovations. 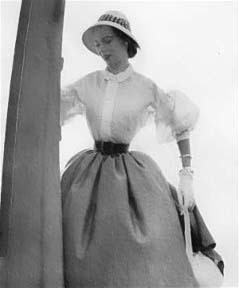 The silhouette consisted of a cinched waist and voluminous skirt. To achieve the desired silhouette, tuck the top into the voluminous skirt. The total color palette is super sophisticated. The shoes and ring add a needed, more modern touch. One of the dresses I designed for the Shabby Apple contest actually fits the idea of the New Look quite well. Take a look if you missed it (design number 2!)! Hope you enjoyed the first edition of this feature!